A mood of conciliation toward South Korea prevails in North Korea ahead of next week's summit between their leaders, at a time when denuclearization talks with the United States are in a stalemate. North Korean leader Kim Jong Un, who wants the easing of international economic sanctions to restore his nation's economy, has apparently been trying to obtain South Korean financial support or aid, foreign affairs experts say. U.S. President Donald Trump has been cautious on warming inter-Korean ties without progress on North Korean denuclearization, amid concern that South Korean President Moon Jae In may take measures that violate U.N. resolutions imposed on the North. At Sunday's parade, floats with the words "The Unification of the Fatherland" and "4.27 declaration," moved through a square in the heart of the capital, with thousands of citizens waving pom-poms and national flags. Kim and Moon issued at their first summit on April 27 the Panmunjeom Declaration calling for "complete" denuclearization of the Korean Peninsula and efforts to declare a formal end to the Korean War by the end of this year. During a mass game show on Sunday, an image of Kim and Moon hugging at their summit in April was displayed. Drones carrying lights formed the words "Shining Fatherland" in the night sky as part of the choreographed spectacle that involved tens of thousands of people and featured acrobatics, dancing and huge mosaics created by students holding up colored cards. 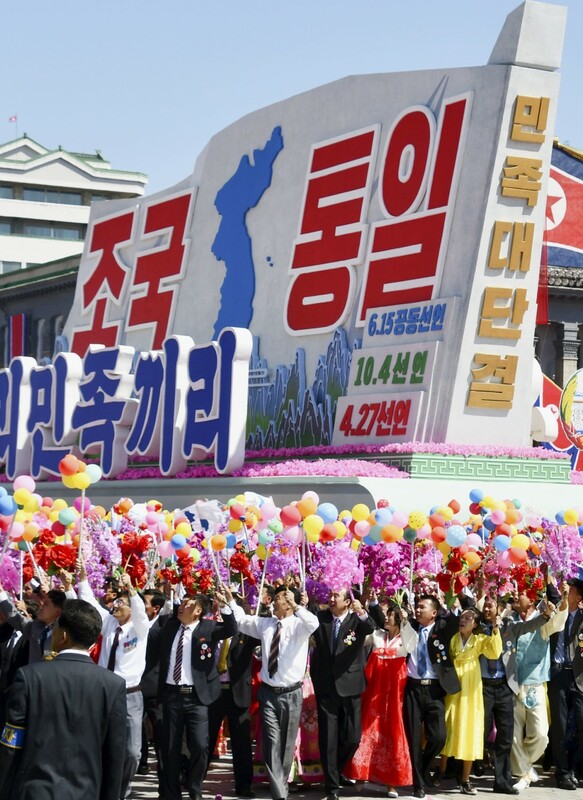 "The north and the south should make steady efforts to mend their relations under any situation and circumstances and sincerely implement the Panmunjeom Declaration," the Rodong Sinmun newspaper of the ruling Workers' Party of Korea said Friday. "There is no need for the north and the south in their relations to read other's face and hesitate," North Korea's most influential newspaper added, emphasizing a thaw in inter-Korean ties. The two Koreas last week agreed to hold the third summit meeting between their leaders in Pyongyang on Sept. 18-20, the South's government said, after a group of officials from Seoul visited the North's capital and met with Kim. At the Sept. 5 meeting with Moon's envoys, Kim voiced hope that denuclearization of the Korean Peninsula will take place during Trump's current term in office through January 2021, South Korean officials said. Skepticism, however, has been lingering that supplies needed to operate the office may violate U.N. Security Council sanctions resolutions to prevent North Korea from developing nuclear weapons and ballistic missiles. In recent months, some U.S. officials and South Korean conservatives have criticized Moon's government for disrespecting the U.N. resolutions as it has put emphasis on improvement in inter-Korean relations. "It has reached the point where the South Koreans are determined to press ahead. They no longer feel the need to act in parallel with us," a senior U.S. official said recently, according to the Washington Post. A source close to the situation in South Korea told Kyodo News, "At the next summit, Moon might promise Kim to offer economic aid to North Korea." North Korea, meanwhile, did not display intercontinental ballistic missiles that can target the United States at Sunday's military parade, signaling Kim's desire to refrain from provoking Trump to resume talks with Washington. Trump thanked Kim on Twitter, saying, "This is a big and very positive statement from North Korea." The president also tweeted, "We will both prove everyone wrong! There is nothing like good dialogue from two people that like each other!" National Security Adviser John Bolton, Trump's brains on foreign policy, said Monday that it is "entirely possible" for the president and Kim to have a second meeting by the end of the year following their historic summit in June in Singapore. But Bolton, known for his hawkish stance against Pyongyang, added, "President Trump can't make the North Koreans walk through the door he is holding open. They are the ones that have to take the steps to denuclearize and that is what we are waiting for." In the first-ever U.S.-North Korea summit, Kim committed to "complete" denuclearization of the Korean Peninsula, but Pyongyang has yet to provide a full inventory of nuclear weapons and fissile materials, as Washington has demanded. North Korea, for its part, has insisted that the United States first declare a formal end to the Korean War, which was halted with an armistice rather than a peace treaty in 1953. Kim has been eager to continue negotiations with Trump for the ensuring of security guarantees from Washington and the relaxation of the economic sanctions that have dealt a heavy blow to North Korea's economy, analysts say.